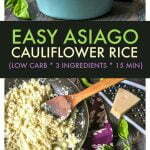 This easy Asiago cauliflower rice is a delicious low carb dish you can make in 15 minutes with only 3 ingredients. Only 3.4g net carbs per serving! In a large saute pan, add the riced cauliflower and 2 tablespoons of water. Cover and cook for 5 minutes. Add the cream and cheese and mix until cheese is melted. Taste to see if the cauliflower is done.